Ultra Deep Solutions, Bygg nr. 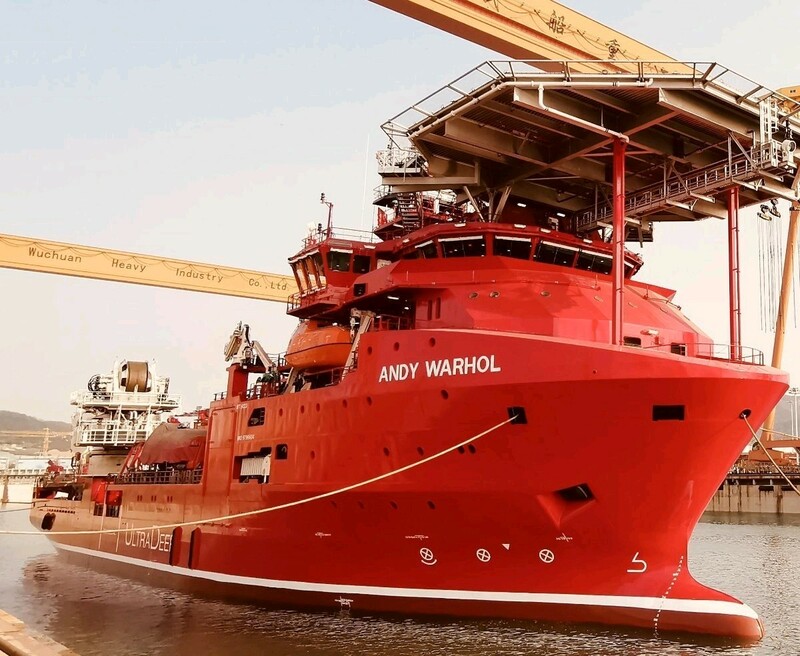 AH0004AM ved Wuchang Shipbuilding Industry Co. Ltd., MT 6023 DSCV "Andy Warhol"
Ultra Deep Group is proud to announce, it has signed a letter of intent to build a DP2 FiFi2 DSCV ‘ANDY WARHOL’ with a global leading shipyards. The DP2 DSCV ANDY WARHOL is a state of the art DP2 Multipurpose Diving Support Construction Vessel / SPS Code 2008, operating on a FiFi Class 2 system while adhering to Tier III NOx Emission Standards. The vessel is equipped with an 18 man single bell Saturation system operating at 300m, a 150t AHC crane with a single fall of 3000m, fitted with a WROV and an OBS ROV and it can accommodate up to 120 personnel. “Our building team has engineered a perfectly timed Subsea construction vessel. Ultra Deep Solutions goal is to build up to 25 Subsea construction vessels by 2018-2019. The downturn in the market has given us the opportunity to look for great pricing in a market where other companies have less Capex. Ultra Deep is expanding and heading in the right direction, we are one step closer to our goal.” Shel Hutton – CEO. Today is our signing celebration for starting the 2 New vessels the "Henri Matisse" and "Andy Warhol". It took us months and months of engineering to perfect these absolutely stunning vessels. Our teams involved from multiple countries around the world managed to put this "dream" together. We will continue to move forward to our goal of building over 20 vessels by 2018. Our vision is simple now, in the past 15 months build the highest Spec' DSV's ships in the world. We've just had another incredible week at Ultra Deep Solutions. The milestone steel cutting of the vessel "Andy Warhol". The team in Qingdao has brought this event far ahead of expectation. Again we would like to thank MT from Norway, DNV-GL and Qingdao ship build site Team for this amazing achievement. Sometimes we forget about the "Andy Warhol". Just starting to get the blocking stage organized. 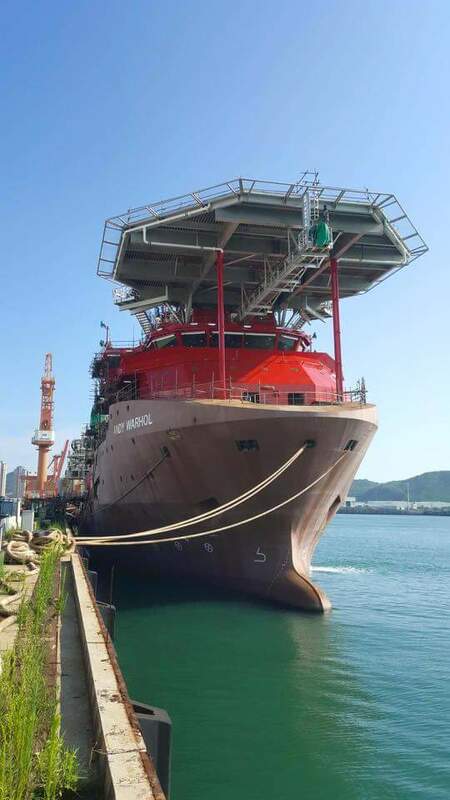 Once again great work to our UDS ship building site team in Qingdao. "Fifteen minutes of fame today" that's all the keel laying ceremony took for the Andy Warhol. We now are on schedule for delivery of Q2 2018. Tremendous effort from MT (Norway), Qingdao CSIC, DNV-GL and UDS site team. The Launch at the end of 2017 is still on schedule. The DP2 17,000 BHP,18 men 300 MSW will fit in nicely to our on going fleet expansion. Tunnel thrusters being installed in the "Andy Warhol". Great work UDS Qingdao site team. As always SEPRO you make our job easy. The Deep Installer and Andy Warhol vessels are proud of the LARS ROV lifting frames you have designed. The 4 LARS frames are testament of the quality for our ROVs that you bring to the Industry. Your engineering is at a level which the Industry deserves. FAT testing complete for the Andy Warhol engines. Fantastic job on our UDS site team in Qingdao. The engines of the DSCV Andy Warhol DNV-GL vessel being installed. Thanks to our UDS site team. The DSCV Andy Warhol stern "Azipod Thrusters" being installed. Great collaboration of many teams to have come this far so quickly on the build schedule. Great weekend news at UDS. The "Warhol" will be launched this December 2017. This vessel is significant as it is built with full oil recovery intervention. Complete FiFi 1,2 and 3. Also with this 17,500 HP ship it comes with a 18 men DNV-GL Diving system and Twin 18 men Divex SPHLs. The "Warhol" is the smallest vessel built in our fleet and is just a tad shy of 110 meters long. The 150 ton crane can easily reach 3000 meters. To help the divers find the work basket on bottom we've added in 2 WROVs with SEPRO handling systems. Also integrated in the vessel is our new ABB OCTOPUS electrical system. https://lnkd.in/f9yb6wr. At UDS we take Diving seriously. The stern of the "Andy Warhol" fitting into place over the weekend. Another great job by the yard and UDS site Supervision. The block weighed in "excess" of 1000 tons. Ultra Deep Solutions "Andy Warhol" with a 18 men saturation system 300 msw. It comes with Twin 18 men SPHL's and 150 t crane to 3000 msw. The Vessel is a MT 6023 Norwegian design. Also as we do it is classed by DNV-GL. Delivery of the Warhol is Q3 2018....... Powered 14,000 KW and Schottel propulsion system. The vessel comes with the most advanced FiFi 3 and Oil recovery system. Also comes with 2 x WROV's built into hangar's. Ultra Deep Solutions DSCV Andy Warhol installing the roof and the Captains seat area. Every week at UDS is a positive forward motion. If you are looking for a job at UDS leave your ego’s at the front door. We only need positive energy. Ultra Deep Solutions will hit another milestone in the coming week. The Launch of the "Andy Warhol". Our teams have been working around the clock to have this fine vessel ready by Q3 2018. The Warhol is an MT 6023 and is fully loaded with an 18 Men Saturation system 300 msw. The DNV-GL also comes with FiFi 3 and full Oil recovery equipment. Announcement for our DSCV Andy Warhol. The MT 6023 Design from Norway 107 m LOA by 23 m Beam 120 POB. The vessel is built under DNV-GL and IRS classification. This vessel has been designed with an 18 men 300 msw Saturation system with Twin 18 men SPHL's. The Andy Warhol comes with FiFi 3 and full Oil recovery system. The ship is designed with Tier 3 emissions to meet the most stringent environmental standards. On the deck the vessel has 150 t AHC crane 3000 m and 2 built in WROV,s in hangars. This ship will now be re-flagged under "Indian Flag". Delivery will be August 2018. "Our planning has always stayed firm from the beginning, 36 months ago. Keep building vessels for markets that need them. The Andy Warhol will be the highest specification vessel to approach the Indian market. We look for opportunity in various regions for Ultra Deeps growth." Ultra Deep Solutions has launched the “Andy Warhol”. The vessel is the 4 th in the fleet now on the water. Delivery of the DNV-GL classed ship will be Q3 2018. It is FiFi 3, 18 men Saturation system to 300 msw. Also comes with WROV’s. “Once again this is another milestone for UDS. We pride our selves in building a quality product for our clients in the industry. We expect a major Charter contract to be solidified on the Warhol in the next few weeks. Our goals remain the same and we will be signing multiple new vessel contracts in the coming months”. "Ultra Deep Solutions keeps DSCV Andy Warhol on schedule October 2018 delivery. Once again great team work and synergy in Qingdao"
Skipet heter Andy Warhol og ikke Warholm. Alle skipene til rederiet er oppkalt etter kjente kunstnere.